Politeness and courteous language is another area where beginning (and even advanced) learners of Chinese stumble. If you don’t know how to act in a given situation, then you have no choice but to fall back on how you would behave in a like situation in your own culture. 请问，芒果多少钱？ qǐngwèn, mángguǒ duōshǎo qián? Please may I ask, now much are the mangoes? This kind of behavior is so natural to an American that it is hard to think it could possibly be inappropriate. But most Chinese would find this behavior odd, even strange. To make matters worse, practically every beginning level Chinese language textbook simply translates 谢谢 as “thank you” and 请 as “please” with no further discussion about how and when to use these expressions appropriately. In China the use of polite language is different. Chinese society is governed to a large degree on hierarchy. That is, you act differently with people above and below your position or status in society. 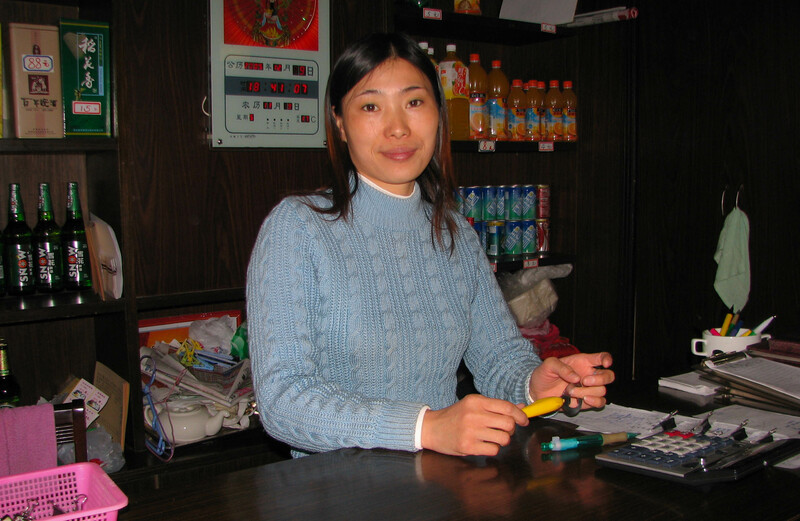 For example, it would be very unusual for a Chinese person to thank a store clerk with a 谢谢 after making a purchase. The same goes for the clerk—they would not use this expression with a customer. The Chinese would likewise not use these polite words with people they are close to, such as family members, friends, and colleagues. With people close to you formal language is not appropriate unless you are intentionally trying to sound sarcastic or distance yourself from the person. Polite language like this is reserved for formal occasions, often when dealing with someone in a social position higher than yours, such as your boss. In recent years there has been a campaign by the Chinese government to clean up their courteous language or improve their verbal hygiene. Erbaugh (2008) reports that as early as 1980 the Chinese Communist Party promoted the use of five courteous phrases, 五个礼貌的词 wǔge lǐmào de cí, based on the impersonal Western-derived phrases, “hello,” “please,” “sorry,” “thank you,” and “goodbye,” with the Chinese equivalents 你好 nǐ hǎo ，请 qǐng ，对不起 duìbuqǐ ，谢谢 xièxie ，and 再见 zàijiàn. The fact that the government would promote the use of these phrases in everyday encounters is pretty good evidence that they are not commonly used by Chinese with Chinese. With increased exposure to the West and increasing numbers of foreigners traveling to China, these kinds of phrases are heard with increasing regularity. Many Chinese who have regular interactions with foreigners understand that these courtesy words are expected and so they use them. But you still seldom hear them used among Chinese. As learners of Chinese we should strive to behave the way Chinese expect people to behave, linguistically and behaviorally. The Chinese should not have to adapt or modify their behavior to communicate with us. In conclusion, here are a couple reminders. 1. Save your 谢谢’s for formal occasions. Resist the urge to thank people in informal contexts such as at restaurants, stores, street markets, etc. You’re not going to offend any Chinese but not saying it. 2. Likewise, save your 请问’s for more formal occasions. Just because you are asking a question does not mean you have to begin with 请问. For example, at a market, if you want to know the price of something, just ask directly. Erbaugh, Mary. 2008. “China Expands Its Courtesy: Saying “Hello.” The Journal of Asian Studies. Volume 67, Number 2. 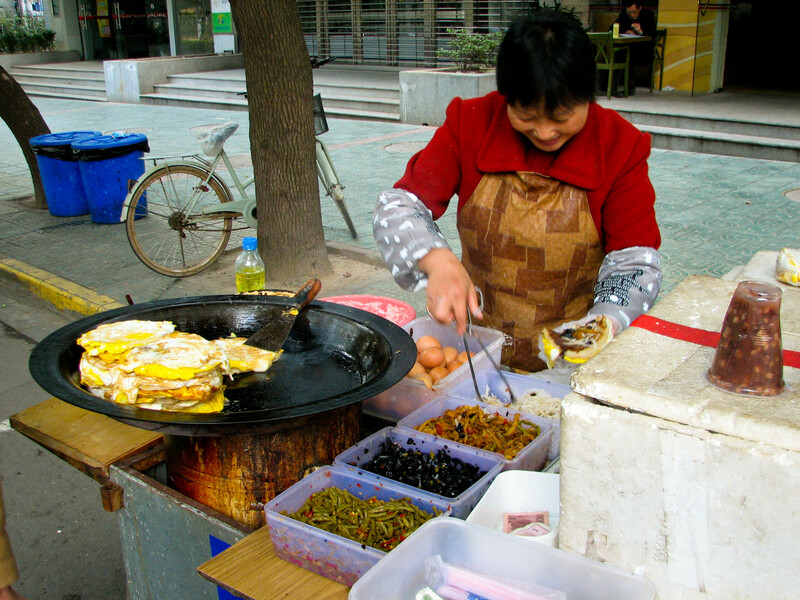 Being a native of Chinese, the vendor certainly did not mistake her for a foreigner because of her Chinese language skills; it was because she initiated this exchange with 你好. An outdoor market like this is very informal, and a formal greeting like this is simply unnecessary and not used among the Chinese. For an American, it would be natural to offer a simple greeting in this kind of context. So, how would a Chinese (and how should you) greet someone in this kind of situation? They wouldn’t use a greeting. They would simply ask how much the item cost. 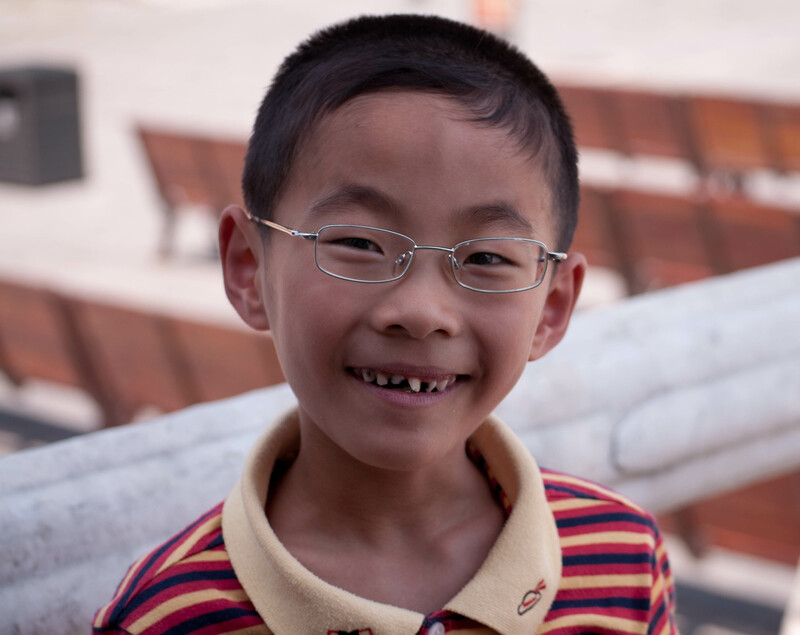 For those who teach or have studied Chinese, you no doubt have been asked numerous times how to say “hello” in Chinese. What is the correct response? Well, it depends on whom you are greeting, your relationship with them, where you are, and so on. In other words, it is not a simple 你好 nǐ hǎo as the vast majority of beginning level Chinese textbooks would have you believe. It is a fact that most textbooks simply state that the Chinese greeting 你好 nǐ hǎo is the equivalent of “hello” in English. End of story. And those textbooks are wrong! Those who have spent time in Chinese speaking communities know that this is simply not the case, except when speaking with foreigners. A few years ago I set out to really determine how and when 你好 nǐ hǎo is used by the Chinese among themselves. In other words, is it an authentic greeting in Chinese society? While directing two study abroad programs in Nanjing, China, I sent my students out onto campus, into the streets, stores, markets, and so on, to observe how Chinese greet each other. The result? Zero occurrences of 你好 nǐ hǎo. That’s right, zero. I then looked at contemporary films from China, and likewise I observed no usage of the greeting. There was one film where one of the characters actually used 你好 nǐ hǎo, but he was accused of trying to sound like a foreigner. I also looked at contemporary fiction, to see if I could find this greeting in use among natives. Again, no luck. After all this field work, and interviewing many native Chinese, I came to these conclusions. 你好 nǐ hǎo is a legitimate greeting but it is only used in formal contexts, and usually when meeting someone for the first time. This would include in a business or academic setting, and usually by someone in an inferior position, such as a student, to someone in a superior position, such as a teacher. Even in these contexts, it does sound like foreigner talk. About the only other time the Chinese use 你好 nǐ hǎo is when greeting foreigners. If this perceived common greeting is really not used that much, then how do the Chinese greet each other. According to my research, the following greetings are commonly used by the Chinese in informal contexts, with people that they are familiar with. 1. A ritual expression such as 你去哪儿 nǐ qù nǎr, meaning, “where are you going?” when seeing someone out on the street. Or, around mealtimes you might say, 吃饭了吗？ chī fàn le ma, meaning “have you eaten yet?” These kinds of expressions are a means of expressing concern or well being for the other person. 2. Acknowledgment of action—this is simply stating what the person is doing when you see them. For example, you come home to your apartment and your roommate is watching TV. You would simply say, 看电视啊 kàn diànshì a, meaning, “you’re watching TV.” This sounds a little odd to an American but is a very common practice among Chinese. 3. Use the person’s name or title—it is quite common among friends, classmates, relatives, and co-workers to say the person’s name or title as a form of greeting. 4. No greeting—In many situations when an American is conditioned to give a greeting, the Chinese would simply say nothing. This is particularly true in service industries where the worker or clerk is perceived to be of a lower social status. 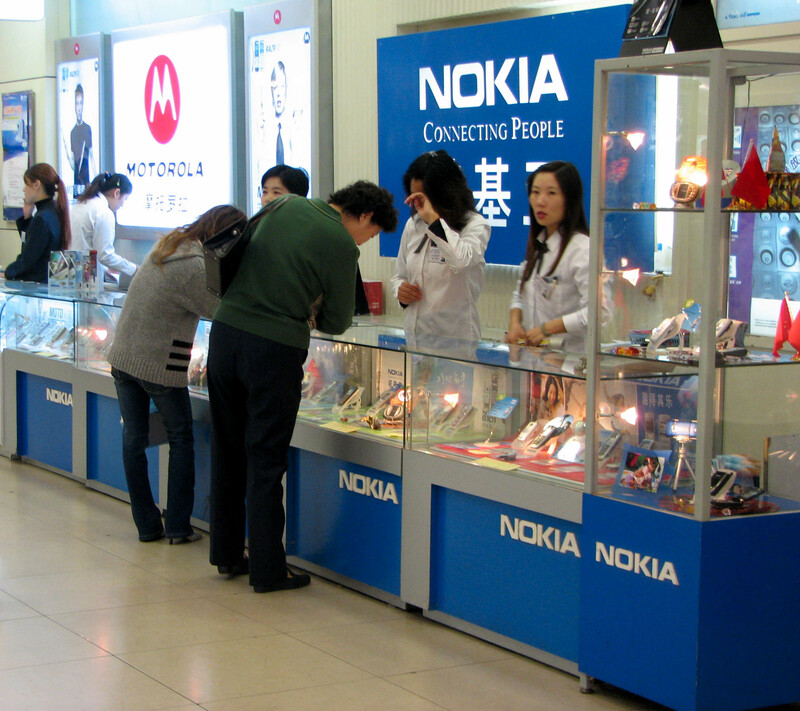 For example, in a store in the US, you would probably greet a salesperson before asking for help. In China, a greeting would usually not be used; you would simply ask for the help you need. 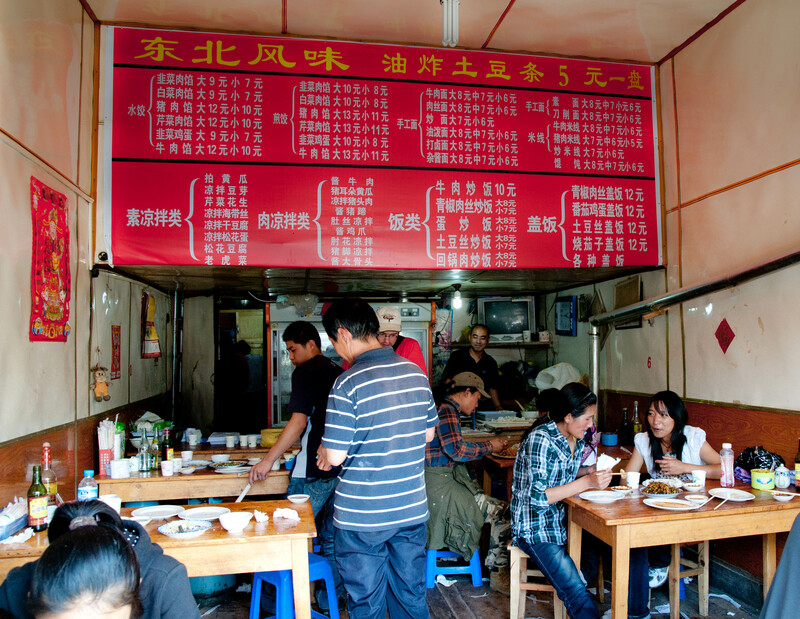 The bottom line is that 你好 nǐ hǎo is associated with foreigners. Resist the urge to equate it with “hello” or “hi.” Foreigners are notorious for overusing it, so restrain yourself and do as the Chinese do. 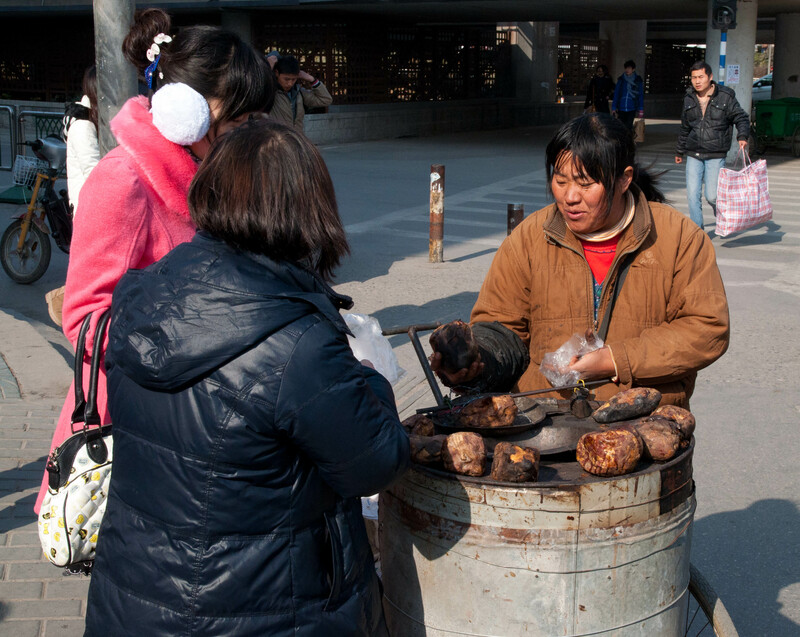 And by the way, you would never say 你好 nǐ hǎo to the person selling sweet potatoes in the picture above. Christensen, Matthew B. “你好 and Greeting Strategies in Mandarin Chinese.” Journal of the Chinese Language Teachers Association. Vol. 41, No. 3, October 2006, pp. 19-34. Erbaugh, Mary. “China Expands Its Courtesy: Saying “Hello” to Strangers.” The Journal of Asian Studies. Volume 67, Issue 2, pp. 621-652. Crossing international borders can be traumatic. This is especially true traveling to a country like China. Even with Chinese language skills in hand, it can be challenging knowing exactly what to expect. In China the rules are different. The servers seemed just as perplexed as my students. These students had two years of formal Chinese study at my university, so I knew that linguistically that they could handle themselves. The problem was that they did not know what to expect in a Chinese restaurant. As such, they had no choice but to fall back on their American cultural experience with restaurants—you are usually greeted and shown to a table. In small restaurants in China that is not the case; you simply find an empty table yourself and the servers will bring you a menu. Being successful in China requires that one learn a new set of rules or behaviors. It’s like learning how to play a new sport. You may be familiar with other sports and be pretty good at them, but if you don’t know the rules of the new game, you probably won’t be a very good player. An analogy might help. Let’s say that American culture is like baseball and Chinese culture is like tennis. Both sports have a good share of similarities—playing fields, boundaries, a ball, an instrument to hit the ball, and so on. If you are only familiar with baseball and show up in China and find yourself on a tennis court, you’re in for trouble. The ball is served to you and your first inclination is to hit the ball as hard as you can, preferably over the fence. This is your frame of reference. And if you hit the ball over the fence, the Chinese will find this very strange. If you continue to do this, they will eventually take their ball and go home, and will probably not invite you to play again. China can be a pretty rough place if you don’t know what to expect. These rules can be better understood as cultural and social behavior, and this goes beyond traditional language training. Even without Chinese language skills, knowing what to expect in typical situations you are likely to encounter will make a huge difference in your interactions with others and your ability to get around and understand what is going on around you. This blog is an attempt to discuss various aspects of learning the Chinese language, explore Chinese culture, and analyze the intricacies of intercultural communication.